Last night's 2-1 defeat against Newcastle plunged Aston Villa deeper into the relegation mire. Once again, Paul Lambert's tactic came under fire. We shall take a closer look at these tactics and see whether they are to be blamed. The 5-3-2/3-5-2 formation that Villa used against Newcastle was designed to give extra cover in the defence - an area that Villa have badly struggled with this season. By adding a third centre-back, in theory it provides added cover. However, rather than acting as a back five, the reality is that the two full-backs/wing-backs in Matthew Lowton and Joe Bennett are simply not good enough to play in this system. Instead, it really ended up as a back three. We can see that the two players were really acting neither as conventional full-backs, nor as wing-backs. They were rarely involved in attacking positions, but they were also not overly involved in the defensive third. This is especially true in the case of Matthew Lowton. It generally meant that either Davide Santon and Mathieu Debuchy, the full-backs of Newcastle, or the two wide players, had space and time on the ball. As a result of this, it often resulted in either one of the central defenders having to pull wide to cover or one of the central midfielders to drop out wide. While this in itself is not a problem, when compounded with the attacking trio of Newcastle that we shall look at later, it left Villa short of cover. With Newcastle playing Papiss Cisse up front on his own, it meant that three defenders to cover him was excessive. Despite this, he was still left unmarked when Moussa Sissoko threaded the ball through to him to open the scoring for Newcastle. However, the other major problem was the attacking trio of Moussa Sissoko, Yoan Gouffran and Jonas Gutierrez. Rather than sticking to assigned positions, the trio tended to float around the attacking third causing Villa all sorts of problems. With Villa's having just two holding central midfielders - Barry Bannan and Ashley Westwood – it meant that one of these was often left unmarked. This problem was compounded when either Bannan or Westwood pulled out wide to close down the Newcastle full-backs. This backs up the earlier observation. Rather than sticking to one position, he floated all over the pitch. The heat maps for Sissoko and Gutierrez look similar. It meant that they were often unmarked and in space to create chances for Newcastle. Normally, you would look for one of the central defenders to step out and cover the unmarked man. However, with one of them being dragged out wide to cover for the full-backs, stepping out would have left just one defender to cover Cisse and any other players attacking forward. Twice this cost Villa. Moussa Sissoko was able to find plenty of space and time to run forward and thread the ball through to Papiss Cisse for the first goal, while Yohan Cabeye found himself in acres of space on the edge of the area to rifle in an excellent second goal, but under no pressure at all. The tactics also prevented Villa from attacking effectively. With the full-backs failing to get forward, there was virtually no width in their attacking play. Once you realise that the five defenders, plus two holding midfielders were generally pre-occupied with the defensive side of the game, it left just three Villa players to try and find the attacking threat. 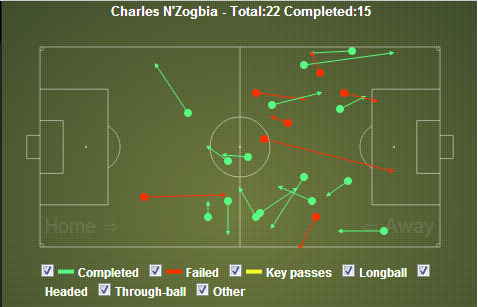 Charles N'Zogbia was playing in the offensive midfield position behind the front two, in theory as the link between the defence and attack, and to create chances. However, he found himself up against Newcastle's pair of holding midfielders, Yohan Cabeye and James Perch. Given that he was meant to be the link between the defense and the strikers, it is noticeable that the vast majority of his passes actually went backward. In fact, in the final third of the pitch, there is only one completed pass that went forward. Naturally, this is not just N'Zogbia's fault - he can only pass to players that are in the right positions. 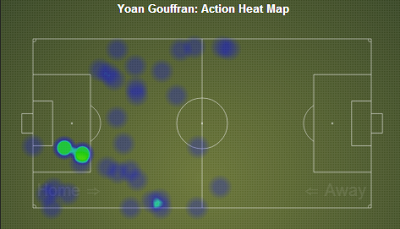 However, it helps to demonstrate why there was so little attacking threat in the first half. 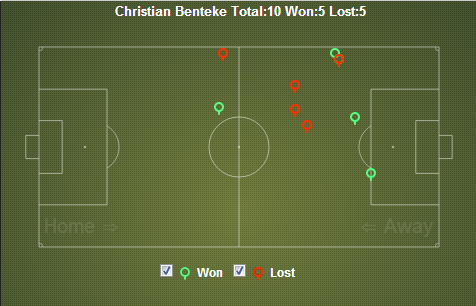 Christian Benteke and Darren Bent found themselves very isolated up front against Coloccini and Steven Taylor. However, they also had the two Newcastle full-backs dropping back to cover when necessary. In reality, Santon and Debuchy played far more as wing-backs than Villa's actual wing-backs. The two headers on the edge of the area that he won, he merely flicked through to Tim Krul with Darren Bent further back down the pitch. The duels in the areas where he might have given Bent the opportunity to run onto behind the defense, he lost. 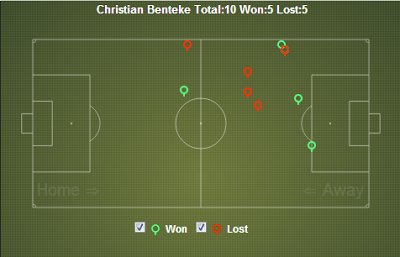 Given his usual standards, Benteke was relatively ineffective in the air. Coloccini and Taylor did a good job battling with him in the air, and on the couple of occasions where he did win the ball, they were in positions where there was little threat. In achieving little threat going forward, it merely invited Newcastle to push forward themselves, putting the fragile Villa back-line under continuous pressure. The midfield pairing of Villa was asked to do far too much in dealing with Newcastle's five-man midfield, as well as covering the full-backs, while the two Villa full-backs were often caught in between – neither providing width going forward, but playing too advanced and allowing too much space in behind. Paul Lambert did change his tactics in the second half, but at 2-0 down, it was far too late. It will be interesting to see whether Lambert will finally give up on the back five after yet another failure, particularly given the improved second half performance with a standard back four.